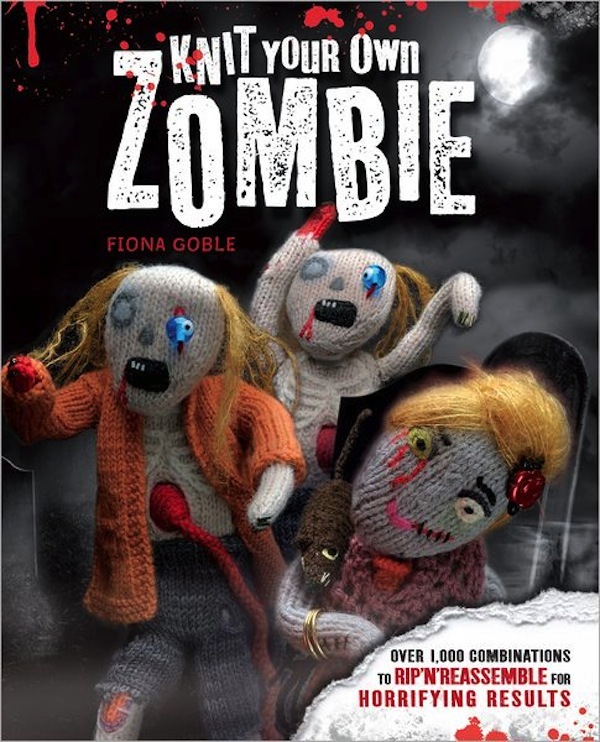 It’s hard to deny that zombies are everywhere and now Fiona Goble has written Knit Your Own Zombies so you can have a less deadly version in your own home. This book includes all the information you’ll need to create your own undead army. This isn’t Goble’s first time writing about knitting. She’s previously written knitting books about creating everything from fairy tales to the royal wedding, and has only now turned her attention to something a little darker. The book begins with an introduction to the basics of knitting–so if you don’t know what a purl stitch is, she’ll set you straight. There are illustrations to go along with the descriptions and basic supply lists so you know what you’ll need before you start. Now you’re ready to knit some zombies! Each project is a different kind of zombie and Goble cutely ties it to a well-known movie. There’s a classic zombie from Night of the Living Dead and a zombie cop after Resident Evil, each with step-by-step instructions and pictures of the process so you know how it’s supposed to look along the way. And since zombies are prone to leaving arms and legs behind as they lurch through the streets, so do these little knit versions. They’re all secured with Velcro strips and snaps so you can pull off heads and arms and even mix and match them. Whether you’re a fan of zombies or knitting or both, the ideas in Knit Your Own Zombie ($15.95) will set you on your way to creating the most adorable army of brain eaters in the neighborhood.